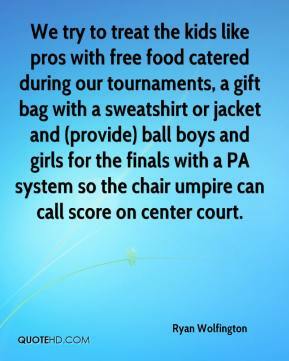 We try to treat the kids like pros with free food catered during our tournaments, a gift bag with a sweatshirt or jacket and (provide) ball boys and girls for the finals with a PA system so the chair umpire can call score on center court. We help the kids that have a lot of talent but limited finances. Our goal is to use tennis as a way to help kids get college scholarships, while keeping them occupied in a sport that teaches them the lessons of life. You have to love what you do, and that rubs off on the kids and then they get inspired. I don't deserve an award, I am having the time of my life.